Intel’s first entry into the Mini-ITX market hit the competition fast and hard with the one-two punch of performance and value offered by the Little Valley series of mainboards. Their low cost, relatively low power consumption and good price-to-performance ratio established Intel as a dangerous and important competitor in the Mini-ITX market. 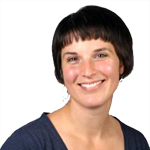 In a short time, Intel had changed the playing field dramatically, establishing traction within a market dominated almost entirely by VIA. 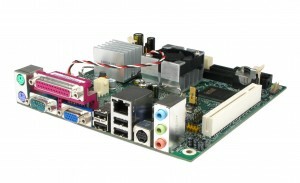 In June of this year, riding on the success of the “Little Valley” series of boards, Intel launched the D945GCLF “Little Falls.” These boards ran cooler than the Little Valleys and featured the much-hyped Atom 230 processor with a listed TDP of only 4 watts (and, less impressively, a desktop chipset that drew eight times that.) These boards launched at the same very low price point as the Little Valley, and the combination of the Intel name and the attractive price-performance ratio caused demand to skyrocket. We soon found ourselves struggling to keep boards in stock, as they flew off our shelves as quickly as we could get them in. Now, it’s September, and Intel is launching a new “Little Falls,” the D945GCLF2. Unlike the Little Valley revisions, in which each new board was a replacement for previous models, the Little Falls 2 is an addition to the product line. It is positioned as a slightly higher-priced, higher-specced board to expand Intel’s Nettop range, with its most prominent feature being the new Atom 330 dual-core processor. At this point, one almost wonders if “LF” stands for “looks familiar.” After all, the Little Falls 2 uses the same board layout as the Little Falls 1, which stole its own basic board layout from the Little Valleys. The rear panel I/O is similar, and the onboard headers and connectors are nearly identical, with only a few exceptions hinting that anything might be different under the hood. This is good news for us, as it allows our fanless Atom-GS-L05 system to accept this new board without any modifications or changes. However, despite appearances, as one can see above, there are some slight yet significant improvements to the board beyond the CPU. The most obvious change, visually, lies in the heat sink configuration on this version of the board. The Little Falls 1 had a tiny fanless cooler on the CPU and an enormous towering fanned hulk on the northbridge. This huge heat sink caused so many case compatibility issues that we bit the bullet and had a custom low-profile heat sink created for the board simply so we could offer it in our systems without a workaround. Intel appears to have listened to complaints somewhat and replaced this monstrosity with a much smaller unit. To reflect the increased power consumption for the dual-core CPU (8 watts, as opposed to 4 watts for the single-core version) the tiny CPU cooler from the Little Falls 1 has been replaced with a taller finned heat sink as well. While only time will tell, I consider this to be a major improvement for the usability of the board, allowing it to easily fit in a wide variety of cases. Also, since the tiny cooler on the Atom 230 CPU in the original Little Falls could get quite hot, it’s good to see a little more thought put into the thermal solution on the board this time around on both the CPU and northbridge. The main upgrade Intel has provided on the Little Falls 2 is the Atom 330 CPU, a 1.6 GHz dual-core version of the Atom 230 CPU featured in the Little Falls 1. Most dual-core processors consist of two processing cores on a single unbroken silicon die. However, on the Little Falls, Intel appears to have placed two distinct Atom CPUs side by side on the CPU package. This undoubtedly allows Intel to keep development and production costs down since they do not need to develop a new CPU die for the dual-core model. These savings look to be passed onto the customers, as before the Little Falls 2, a dual-core Intel solution for under $100 was unheard of! Each core of the Atom 330 supports Intel’s Hyper-Threading technology, which creates a second virtual “core” in addition to each real one. Thus, any Windows system considers the Atom 330 to be a quad-core processor in terms of lining up CPU instructions. While explaining how Hyper-Threading works would take more time and space than we have in this article, this extra functionality can (depending on the application) increase the overall speed of multitasking or multi-threaded applications. It will be interesting to see and evaluate how a dual-core processor with Hyper-Threading performs, as this is the first Intel processor to support both of these multi-threading technologies. The extra connectivity on the Little Falls 2 is a nice bonus to add to the dual-core Atom processor. Intel has added to the Little Falls 2 a rear-panel S-Video out, an extra internal USB header (bringing the total number of USB ports available to 8,) and full 6-channel HD audio through the internal headers. The 10/100 LAN port has been upgraded to a Realtek Gigabit LAN, which is a nice little boost for a board designed as a “Nettop” platform and is thus intended to be used in a segment of computers designed for Internet surfing. Because the board layout is identical between the Little Falls and Little Falls 2, the Little Falls 2 fits effortlessly into our fanless Atom-GS-L05 system. This allows us to offer dual-core Intel processing power in a solid state system at a reasonable price point. For our non-fanless systems, the fact that Intel now uses lower-profile cooling solutions means that case compatibility is much less of an issue. This is a relief, since case compatibility was a HUGE sticking point for the original Little Falls. The only real black mark on the new Little Falls 2 is the chipset, a weak point it shares with its little brother, the Little Falls 1. 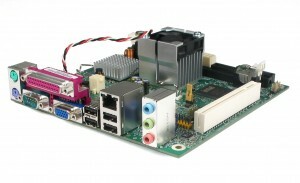 Certainly, the onboard connectivity and GMA 950 integrated graphics offered by the 945GC chipset is more than adequate for the overall level of performance the board can offer, but it is disappointing to see such a highly efficient CPU paired once again with a hungry and hot chipset—a 35 watt TDP power draw, compared to the low-powered 15W TDP SiS chipset Intel used on the Little Valleys. In fact, the 945GC chipset uses more than four times more power than the processor. This means that, despite the extremely efficient Atom processors, both Little Falls boards draw more power than a VIA solution of equivalent performance. While the Little Falls is not explicitly targeted at VIA’s low-power/embedded market niche, it certainly seems like somewhat of a wasted opportunity to pair a brand new hyper-efficient processor with an ancient chipset. 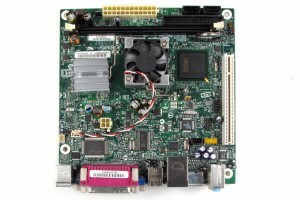 All in all, the new D945GCLF2 “Little Falls 2” is a strong addition to Intel’s Nettop Mini-ITX product line. Dual-core capability, extra media connectivity, and an improved thermal solution address many of the concerns leveled at the initial Little Falls. While Intel unfortunately still insists on pairing an 8W processor with a 35W desktop chipset, this decision appears to help keep the price point of the board down to an extremely attractive level. Indeed, in terms of sheer bang for the buck, when building a basic Mini-ITX system, it’s hard to beat the Little Falls 2. What PCI riser does one need for the LF boards? You’re building this system with dual pci available, but I can’t find that riser listed anywhere. The C137 case needs a dual PCI riser card and an additional PCI extender card (beyond the one the case comes with) to use both PCI slots. Thanks. Is there a riser that will fit in the 7677 or C159 cases? Or can I just use that and do away with the riser bracket in both of those cases? Setting the jumper to 24 makes both slots function. Nice review. Is this board suitable for the Chenbro case? Is it the ideal board you hinted at in the Chenbro review? I kind of doubt it as I’d expect a good NAS to want more cpu but had to ask. Sorry to be such a nag, but I bought a Dlink DNS-343 to replace a home grown Ubuntu NAS and am unhappy with the perormance. I’d like to build a new NAS with the Chenbro and sell the DNS-343 while it is still “hot”. Thanks for the feedback! This isn’t the board that I hinted at. The board that I mentioned in the Chenbro case review is the Gigabyte GA-6KIEH-RH. We are getting these in, and the person who wrote this review on the Little Falls 2 mainboard, Josh, is working on my part 2 of the Chenbro case review using the Gigabyte board. Expect to see the review posted in the next few days. We have never carried anything from Gigabyte before, so we’ll see how our customers respond. Thanks for the update and sorry about not noticing Josh wrote this post. The GA-6KIEH-RH looks like an interesting board. My friends and I have had very good experiences with Gigabyte main boards so I have high hopes. The fake RAID support seems clunky since it is stuck at 150Mbs but I wouldn’t use it anyway. I’d rather go SW RAID or real HW RAID from an easily sourced card in case the controller dies. Looking forward to installment #2 from Josh on the Chenbro case. I bought the fanless duo-core LF-GS-L05 system and monitoring the temperature in the bios is a little worrying. Core temp of around 57C, ambient temp around 47C in a normal room at 65F. I’m wondering if there is adequate cooling or if there is more that can be done and remain fanless. Thanks. Intel’s max processor temperature listed for the Atom 330 is 85C so the core temp is well within the operating maximum. The board’s specified maximum operating temperature is 55C, which is again quite a bit less than you are measuring. All our systems are tested to operate within their specified operating temperature range (0 to 55C in this case) and every system is thoroughly tested for 24 hours before we ship it. I hope this helps. We do offer more powerful (in terms of cooling) fanless solutions designed for Intel Core 2 Duo processors, but they are not currently designed to work with Atom-based mainboards as they would be overkill both in terms of physical size and (especially) cost. I recently purchased the little falls 2 and overlooked the fact that it has a 24 pin atx connector – I initially tested it open on the bench with a full atx psu. It wasnt until i started to assemble it all, when i realized my pico psu (120) is only 20 pin. I had already purchased a molex to p4 adapter and a “y” splitter. This is something worth mentioning in the product description for the others who intend to use similar psu’s. After doing some digging on the web I saw some mention of an adapter available but failed to find anything like it any where. I tried to check intels site for the product guide – both intels site and logic supply’s link point to the little falls product guide and not the little falls 2. Is there a place where an adapter can be purchased or will I have to scrap my pico psu for an alternative? I really dont feel comfortable using adapters or adapter cables and looking at the other psu’s available at the site; it looks as if most if not all are 20 pin connectors as well. I’m stuck. As an added note, once i fired the board up for the first time the fan turned out to be a noisy little guy. My first priority was to replace it. Temps werent too bad to begin with on the northbridge but i like my processor temps lower than what it was. I purchased 2 identical asus northbridge heatsinks and 2 scythe 40mm fans and replaced the stock. Temps are far better and the system is still much quieter with 2 scythe fans than with the single origional fan. Any input on my atx issue would be greatly appreciated. Thanks in advance. I did some digging on the web and it appears that the remaining four pins are redundant/unnecessary for this particular board and its application (non-gaming). If someone could just confirm for me that there are no negative effects from using the pico 120 with this board, i would greatly appreciate it. I was incorrect when i mentioned “Asus” heatsinks earlier – they were really zalman 32k heatsinks. Happens when your building 2 computers at once. Thanks for the insight about the Zalman heat sinks. As for the 24-pin BTX power connector on the Little Falls 2, those extra 4 pins are NOT necessary for the board to function. 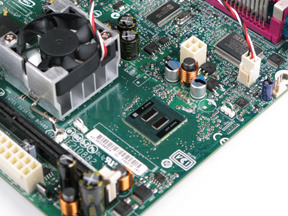 The vast majority of our systems use the standard 20-pin ATX power connector (or a PicoPSU) with no ill effects. Sure does – and i want to thank you for the input and the fast reply. I just needed that confirmation from someone better versed on the subject than myself. So, I hope I’m not opening a can of worms here but the question remains. Why? Why did intel decide to switch to 24 pins with the revision. Rumors from some are that it is to support the designs of oems. What is the estimated lifespan of Little Falls 2 from now? We are told that the Little Falls 2 will be around for another 18 months.